New Year’s Eve is somewhat of a magical day. For one day everyone reflects on all of the good and bad the previous year brought them and doubles up on their hope for the next. For that one day everyone, everywhere shares the same optimism that the year to come will be the best one yet. For Courtney and Rolando New Year’s Eve carried more than just reflection and anticipation for the new year. These two picked New Year’s Eve as the day they washed themselves clean of the “Engaged” title and made it official by tying the knot. I think anyone would be hard pressed to find a better day to start such a big and exciting chapter of their life! Looking back at the day as a whole the big thing that stick out to me was how much fun everyone had. 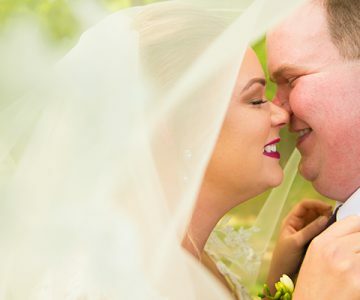 From getting ready in the morning at GSV Design Group, for hair and make up, the ceremony and reception, at Elm Ridge Party Center, it seemed like everything was somewhat free flowing, fun and organic. Aside from the fun had by everyone in attendance, one other constant throughout the whole day was the sense of family. I remember walking through the hotel these two were getting ready at and every corner I turned around had another family member anxious to see the new bride and groom and congratulate them. Needless to say the reception was a party to remember. Led by Brian, Owner/DJ of Buckeye State Entertainment, the guests partied all the way through midnight and beyond. Whether it was cramming everyone into the photo booth, getting a caricature drawing, or just going crazy on the dance floor, there were no shortage of smiles around the room. With everything said and done I can’t say enough good things about Courtney, Rolando & their supporting cast made up of their wedding party and guests. I feel extremely honored and happy to have brought in the new year with these guys and wish them nothing but the best moving forward! Happy New Year and thanks again so much for making us a part of your big day!